When he was not even ten, Ajinkya Rahane was hit on the helmet by a fast bowler probably thrice his age in a local match in south Mumbai. He sat on the ground crying for a while, before refusing to go off the field, taking his stance again and hitting the same bowler for five successive fours. In Durban in 2013, Rahane ducked into another bouncer. But, he wasn’t crying this time. Four deliveries later, another short ball arrived. And, Rahane pulled Dale Steyn for four. He remained unbeaten on 51. In the second innings, he was the last man out, for 96 in a total of 223. Two months later, he made his maiden Test century, in Wellington. In July, he scored a hundred at Lord’s, emulating his idol, Rahul Dravid. In December, he made his highest Test score, 147, in Melbourne. From spending 18 of 19 Tests on the bench, and failing on debut, Rahane had become the first choice for the No. 5 slot. Success was not restricted to Tests. Originally thought to be too old-fashioned a player for the limited-overs formats, Rahane changed perceptions with consistent performances in the Indian Premier League. In 2014, given a chance to open the innings in one-day internationals, in place of the injured Rohit Sharma, Rahane scored two centuries, one in England and one at home against Sri Lanka, securing his position in the ODI side. Former England captain Michael Vaughan has called him “the best technical player” in the Indian team. Former Australia captain Greg Chappell was impressed enough to say that “across a range of conditions, against a range of oppositions” Rahane was likely to be consistent. “Anyone who plays with him knows he is a tough kid,” says Dravid. “He has got a steel about him.” That steel was developed early, when Rahane used to commute to south Mumbai’s maidans from Dombivli, which lies about 50 km north. When he was a kid, Rahane was told to wait till the 7.30am train had come to a halt. As the train slowed, the older boys would jump in and grab seats. Rahane would board after the melee had settled and sit in the lap of one of his older team-mates. As he got older and played for representative teams, he started travelling alone, kitbag in tow, leaving at dawn to report for early starts. Rahane does not do aggression, swagger or angry celebrations. He is not flamboyant. He talks haltingly at press conferences. He does not stare at you from billboards. He wears an almost apologetic expression. You can sense he is wary of the limelight. Shy. Reserved. Meek. These words progressively attached themselves to him. And, gradually, there was a perception that Rahane was not cut out for international cricket. Some felt he did not have the game for the highest level. Some felt he was just too nice to withstand the pressures an international player has to endure. When asked about being termed too “decent” for international cricket, Rahane showed rare emotion, pointing a finger firmly to his chest as he spoke. “I am not shy on and off the field. Instead of decent, it is far better to call me humble. That is my upbringing. I have come from a lower middle-class family and I value each and every thing. It was an effort at the start to even get a bat. Arvind Kadam sir [whose club he played for] helped me get cricketing gear. Many times, I used to soak the whites I had worn for morning practice and wear them again for evening practice. Amol Muzumdar, the former Mumbai captain, knows a thing or two about perception. “Lots of myths float around in Indian cricketing circles,” Muzumdar says. “And, one of them is that you have to be in somebody’s face to be recognised. That is not true. Ultimately, what is important is to score runs. That is how I think Ajinkya also looks at it. You can’t fill a team with 11 ViratKohlis. In September 2010, Rahane played for the Board President’s XI against the Australians in Chandigarh. Shane Watson watched him make an unbeaten 113 off 111 against an attack that included Mitchell Johnson and Ben Hilfenhaus. 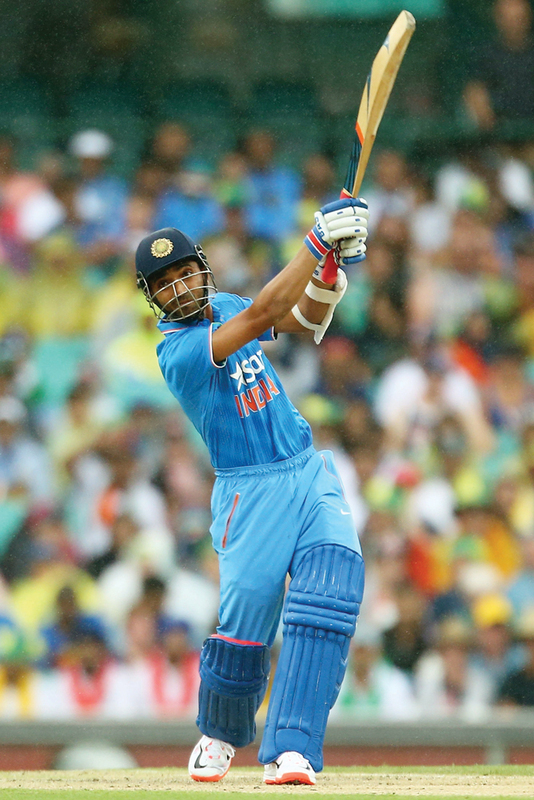 An impressed Watson called his IPL franchise, Rajasthan Royals, to recommend Rahane. Dravid, who joined Royals before the 2011 season, was also interested in the “curious” young batsman who had come up to him in Mumbai around 2007 to ask questions about batting. It was around 2am one night in Kolkata when someone knocked on Bharucha’s hotel-room door. It was Rahane, who wanted to discuss his batting. Bharucha says that Rahane is “paranoid” about practice. At times, Bharucha had to tell him to stay in the hotel, since all the net bowlers were tired. Rahane was so engrossed in practising with Amre last year that Amre had to have Rahane’s birthday cake delivered to the nets. He practised till two days before his wedding. After returning from England in 2014, he cut short a leisure trip to resume practice. AjitAgarkar jokes that Rahane should take a bowling machine wherever he goes. Dravid calls Rahane one of the most hard-working guys he has known. If Rahul Dravid has to tell you to “relax and chill”, you probably need to. Rahane made his Test debut against Australia in Delhi, in March 2013, after 16 straight games on the bench. He got his chance only because Virender Sehwag was dropped, Shikhar Dhawan was injured and Gautam Gambhir was ill. It was close to the worst debut a batsman could have. He lasted 18 balls before gloving Nathan Lyon to backward short-leg. The second innings was worse. He staggered out to Glenn Maxwell off the fifth ball he faced and holed out in desperation. Working hard came early to Rahane. He earned his black belt in karate by the time he was around 12, and that rigour reflects in his approach to fitness. He is one of the country’s finest fielders. His father believes that boys can lose direction between the ages of 20 and 25, but that despite experiencing fame and money, Rahane’s values have kept him grounded. “Very rarely do you see a cricketer who is very clear that money, fame, and style are secondary,” says Atul Srivastava, Rahane’s manager for more than seven years. Srivastava is yet to meet another cricketer who, even in his fourth year as an international, says he does not want to rush into endorsements. After his forgettable Test debut, Rahane was back on the bench for the home Tests against West Indies, in November 2013. Rohit Sharma began with 177 on debut at Eden Gardens and followed it with 111 not out in Tendulkar’s final Test. After the match, when Tendulkar was sitting in the dressing room, Rahane walked in to say one final goodbye. As he turned to leave, Tendulkar stopped him and told him that it was now up to Rahane. “I said to him that he might feel hard done by what had happened in his career so far, but he should continue to be the way he is, for I was sure Ajinkya would get another chance,” Tendulkar writes in his autobiography Playing It My Way. If Rahane continued to serve cricket the way he had always done, wrote Tendulkar, the game would take care of him in the future.